A geomanifestation is any distinct expression of an ongoing or past geological process. They often point to specific geologic conditions. Examples include seismicity, gas seeps, local compositional differences in groundwater and springs, thermal anomalies, mineral occurrences, jumps in hydraulic head, overpressured zones and geomorphological features. Geomanifestations are mostly local expressions and are therefore too often ignored as ‘anomalies’. They certainly deserve better. Many of them are associated with regional processes, active faults, etc. That means that they may be the ultimate key to better understand the importance of geology in our daily lives. 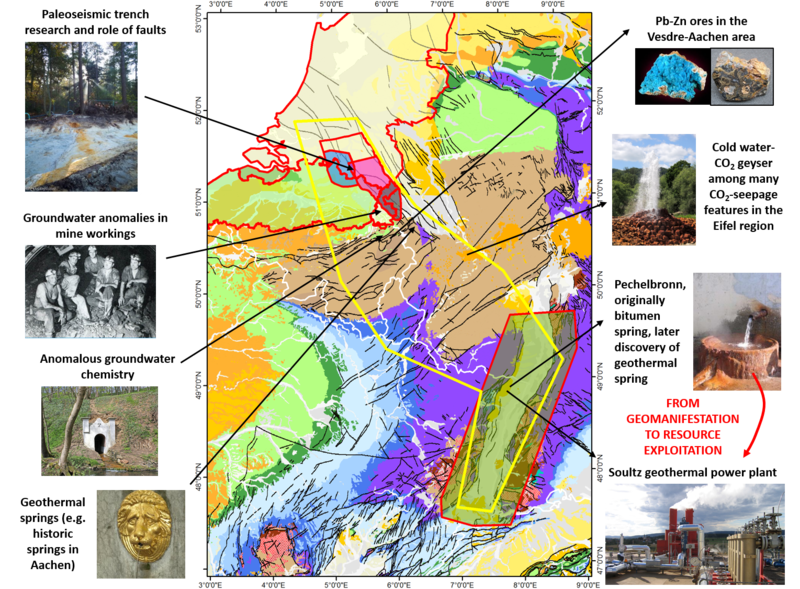 To illustrate this, the examples shown in the collage are not just scientific curiosities, but instead linked to using subsurface resources. All these examples come from the Roer-to-Rhine area, but GeoConnect³d will focus on geomanifestations also in its other case and pilot areas. Geomanifestations leave a lot to blog about: about how they complement our geologic understanding, how they are important to us as a society, etc. This certainly will not be our last post. But in order to study them, we first need to find them. The collage shows a first map pointing out where you can find a first selection of our favorite geomanifestations. Perhaps you get inspired to visit some of those sites yourself. That is great, do so! Or maybe you know some special occurrences yourself. In that case, we invite you to share your favorite geomanifestations with us, so we can transform this page into an active community dataset for the GeoConnect³d project (especially for the R2R case). The result will be an inspiring collection of geosites. So feel free to leave your input as comments below, on facebook, or simply mail us at Karine.Wuyts@naturalsciences.be with location (coordinates), short description, pictures (with date), your name, and why you think that geological anomaly should not be overlooked. Do so and take active part in geological research in Europe. Note: This blog is optimized for viewing in Chrome or Firefox. In other browsers: click on images to display them in full resolution.